Chicago Parent's Going Places magazine is available free at various locations around the city and is also archived online. Their website has a calendar of kid-friendly events and resources of all types including for children with special needs. This helpful travel guide is available in bookstores or online. Their website also features a mini-guide for Chicago. Headquartered in Chicago, Sittercity is an online babysitter resource serving all of Chicagoland as well as other major cities. 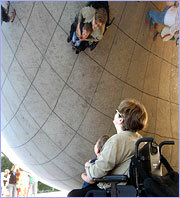 They have sitters experienced in caring for children with disabilities and also elder care. Families traveling with children, with or without disabilities, will find Chicago a fun, welcoming place with lots to do and see, much of it free or affordable. In warm weather the city's many beaches and parks are a major draw, and in winter one can play miniature golf or video games at Navy Pier or explore the lush tropical vegetation in the Garfield and Lincoln Park Conservatories. The top kid-friendly attractions are Navy Pier, with its summer fireworks, Ferris wheel and IMAX movies; John Hancock and Sears Tower Observatories; Millennium Park; and the Lincoln Park and Brookfield Zoos. Popular museums include the Chicago Children's Museum, Peggy Notebaert Nature Museum, Museum of Science and Industry and all three facilities on Museum Campus-Adler Planetarium, Shedd Aquarium and Field Museum. Chicago History Museum has exhibits and activities that are fun and educational, and the Art Institute has adaptive programs for children as well as adults. In addition to discounted admission for children, many museums offer free admission one day or evening per week. Some like the Mexican Fine Arts Center Museum are always free. While Chicago is famous for its summer music festivals, city-sponsored events and concerts continue year-round at venues such as the Chicago Cultural Center. A number of theatre companies specialize in children's productions including Chicago Playworks (DePaul University Merle Reskin Theatre), Goodman Theatre, Lifeline Theatre, Raven Theatre and American Girl Theatre. Noble Horse Theatre, where the performers are horses, is also great fun for kids. When choosing a hotel, Easy Access Chicago can help identify not only those that meet your family's access needs, but also have accessible pools or complimentary breakfasts. Most allow children to stay free in their parents' room but some may charge above a certain age, so do ask in advance. For added convenience, the guide lists hotels and restaurants by neighborhood. The Magnificent Mile area is a popular choice for families because of its proximity to Navy Pier as well as many kid-friendly restaurants such as the Cheesecake Factory and stores such as Niketown Chicago, Lego and American Girl Place. Families requiring wheelchair transport should have no problem getting around Chicago since ramped taxis are readily available and CTA buses are 100% accessible. The Chicago Transit Authority offers reduced fares to children aged 7-11, while those under 7 ride free.